Summary: Françoise Laurent is the daughter of a prostitute and a soldier in 1700s New France. Trained to be a washerwoman by her mother, she has dreams to rise above her station, and when he parents die from illness a neighbour helps her get a position as a ladies’ maid. In her work for Madame Pommereau, she finds what she thinks is an ally and a friend, but her knowledge that she and the Madame should be considered equals gets her into trouble when she steals a pair of ladies’ gloves. Her crime earns her the punishment of hanging by noose to deter other uprisings and maintain the status quo through fear. Faced with certain death, François seeks to use the loophole of marrying the hangman to save her life. After the present hangman dies before her hanging takes place, first she must find a new one to take his place. Review: Using a few historical details, Kate Cayley fleshes out the tale of sixteen year-old Françoise’s journey to avoid the hangman’s noose. Living in the early 1700s, the only thing she’s really guilty of is having the ambition to want to rise above her station in life. As a woman, and what would be considered a peasant if she lived in France instead of New France, this is unacceptable. And when she slips up, those in power will make her pay by making an example of her. I love the title, The Hangman in the Mirror. Cayley writes beautifully, setting up the end of the book with one of the beginning scenes with François and her friends looking for their future husbands in her mirror. I’m sure she never would have expected to see a hangman there, but when the time comes and he is her only choice, she accepts it. Françoise’s story is powerful and sad, because I wonder if she really did come to love Jean, or whether she was manipulating him into saving her life, and perhaps selling his own soul in the process as he takes up the hangman’s job. I hope she genuinely loved him, but with her strong will to survive and thrive, I would understand if she was using him. Given her circumstances, one could hardly blame her. Did she stay with him after they married? Were they happy? These are things the history books does not tell us, and Cayley’s book can only last so long. I especially loved this book because I learned a lot about the role of women in the 1700s. With the class system and the gender roles, Cayley conveys the role of woman as useless, pretty objects or hard-working servants with striking clarity. While Françoise is ambitious and wants to rise in the ranks of society, I’m not sure she would have been happy having the same station as her employer, Madame Pommereau, because I think she would have found such a life to be tedious and unfulfilling. Though she steals the gloves, implying that she does want to be a fancy lady, she constantly notes the wastefulness and entitlement of those in the house with judgement. For Françoise, being a wife was not a role she aspired to, so when marriage was the only way to save her life, I felt for her. In the end she had to settle for marriage or death, and she chose marriage. How frustrating it must have been for her to realise that her life was once again dependent on a man. 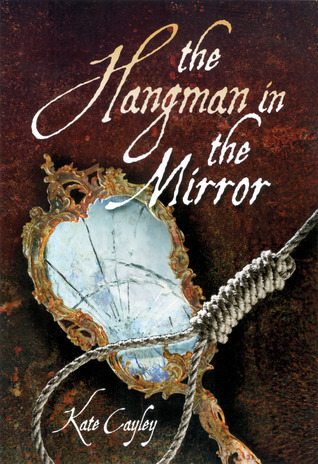 The Hangman in the Mirror is a thoughtful, well-written piece of historical fiction, and I would recommend it for mid to older teens because it contains great depth and character development. The Hangman in the Mirror by Kate Cayley is published by Annick Press, (2011).